China, a Pakistan ally, has stonewalled India's efforts to get Jaish-e-Mohammed chief Masood Azhar recognised as a global terrorist by the UNSC. 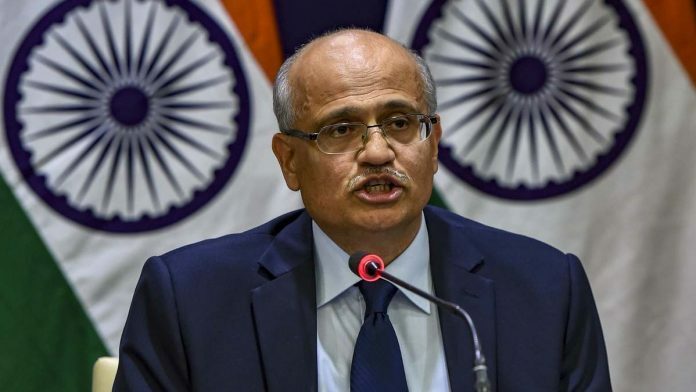 New Delhi: Foreign Secretary Vijay Gokhale Tuesday briefed the ambassadors and diplomats of several key countries, including the five permanent members of the UN Security Council (US, UK, France, Russia and China, known as ‘P5’), about the IAF strike in Balakot, Pakistan. “The Foreign Secretary and other secretaries are briefing foreign envoys, including P5, during the course of the day,” a senior official of the Ministry of External Affairs said. India, a diplomatic source told ThePrint, is hopeful that China may finally come on board to get Jaish-e-Mohammed (JeM) chief Masood Azhar recognised as a global terrorist at the UN Security Council. The JeM, which is based out of Bahawalpur in Pakistan, had claimed responsibility for the 14 February terror attack that killed 40 CRPF personnel. At a press conference Tuesday about the IAF strike, Gokhale said that Pakistan had failed to pay heed to India’s repeated requests to take decisive action against the JeM. This is why, he added, New Delhi was compelled to take pre-emptive action to stop the JeM from carrying out more suicide attacks against India. It needs to be noted here that the P-5 countries have unitedly condemned the Pulwama attack and called it “cowardly”. In a statement issued last week, all permanent as well as non-permanent members of the UNSC had highlighted the need to “hold perpetrators, organisers, financiers and sponsors of these reprehensible acts of terrorism accountable and bring them to justice, and urged all states, in accordance with their obligations under international law and relevant Security Council resolutions, to cooperate actively with the Government of India and all other relevant authorities in this regard”. External Affairs Minister Sushma Swaraj is expected to take up Pakistan-sponsored terrorism at the 16th Russia-India-China (RIC) trilateral, as well as during her bilateral meetings with her Chinese and Russian counterparts Wang Yi and Sergei Lavrov on 27 February. Pakistan has slammed India’s IAF strike, accusing New Delhi of committing “uncalled for aggression to which Pakistan shall respond at a time and place of its choosing”.